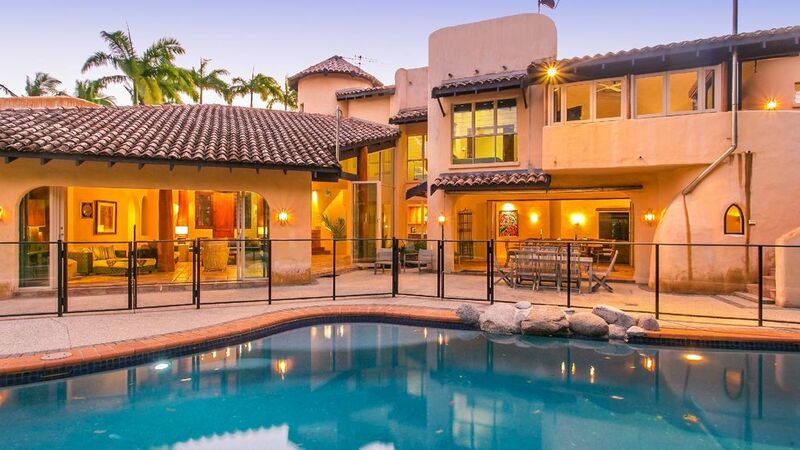 An icon in Port Douglas real estate, this magnificent Mediterranean style family home stretches over two absolute beachfront blocks in Solander Boulevard. The house features three spacious lounge areas and a large covered dining area. Outside the extensive patio has a full gas barbeque and overlooks a 25 metre swimming pool. Through the landscaped grounds there is a private pathway to Four Mile Beach. An entertainer's delight, the large wrap around kitchen has granite benches and quality, oversize stainless steel appliances. A spacious storage area is fully equipped to cater for every occasion and leads through to a convenient walk-in cold room. Downstairs are two bedrooms each with two single beds and a large master bedroom with a king bed, TV and private access to the front garden. The grand living area has high ceilings and extensive seating, a second living area has a comfortable lounge and TV. An additional recreation room has an additional TV. The bedrooms and the recreation room are all air-conditioned. A sweeping indoor spiral staircase leads to the upstairs bedrooms. The master suite has an en suite bathroom, walk in robe and a private sitting area with TV and a balcony that overlooks the pool. An exterior staircase provides quick access down to the pool. A separate bedroom with a King (or Twin singles) plus Twin singles can be partitioned with louvered doors to make two independent bedrooms which share their own full bathroom. There is a full size family laundry, a two car garage, Table Tennis table, four TV's, Foxtel, a WiFi internet connection, stereo, DVD and a fully fenced 25 metre swimming pool. Thank You for looking after us while we were in Port Douglas recently… As you know it was our first trip to the area and we enjoyed it immensely. La Casa Mirasol was ideal for what we needed for the extended family – with great space and fabulous amenities. We couldn’t have been happier.